A small and environmentally sensitive island in the South Thompson River, Banana Island Park is not suitable for recreation. The park protects spring salmon spawning grounds and nesting grounds for a variety of birds and waterfowl such as Canada geese, osprey and bald eagles and also wintering habitat for tundra and trumpeter swan. Nesting waterfowl are found here from April to July, with nesting raptors from spring until August. Note: There are no camping or day-use facilities provided at this park. There are no toilets in the park. Special Note: Banana Island is not suitable for dogs due to wildlife issues and the potential for trauma to nesting waterfowl. This is a very sensitive area, used from spring through late summer by nesting birds. Banana Island is located on the South Thompson River, approximately 35 km east of Kamloops. The closest communities, towns and cities are Pritchard, Kamloops and Chase. History: The park was created on April 30, 1996 as a result of recommendations made in the Kamloops Land and Resource Management Plan. Cultural Heritage: Cultural significance is associated with the historical use of the river, evidenced by the many kekuli pits (semi-underground pit-houses) on the island. Historical use by the Neskonlith Indian band. 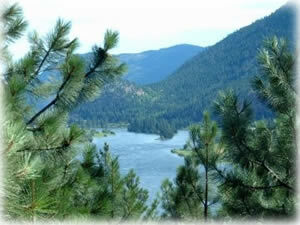 Conservation: The island is long, narrow and vegetated with ponderosa pine and grassy undercover. It is a significant waterfowl nesting site, especially for Canada geese and also for osprey and bald eagle, and wintering habitat for tundra and trumpeter swan. The downstream end of the island is also near spring salmon spawning grounds. Wildlife: Nesting waterfowl are found here from April to July, with nesting raptors from spring until August. Canoes or kayaks provide access to the island. Good spinning and fly for trout. Also whitefish and bull trout when in season. Anyone fishing or angling in British Columbia must have an appropriate licence. There is viewing of Canada geese, osprey and bald eagle, and wintering habitat for tundra and trumpeter swan.